Mammal stranding response teams from the University of Hawai‘i-Hawai‘i Institute of Marine Biology and NOAA, supported by officers from the DLNR Division of Conservation and Resources Enforcement (DOCARE) were unable to get close to the reef on Tuesday due to very shallow water conditions. Harbor agents at He‘eia Kea Small Boat Harbor have advised all commercial tour boat operators to not venture close to the carcass, due to the expected presence of sharks. 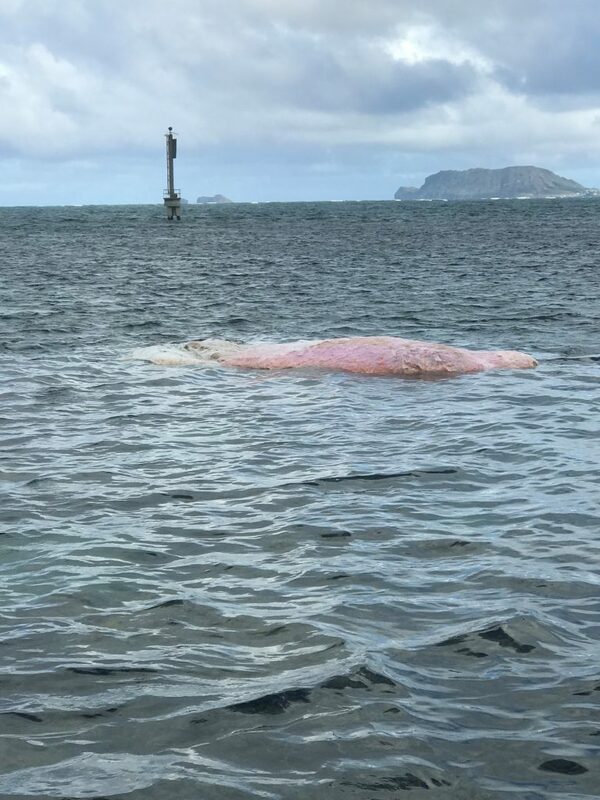 “Despite recent photos of people swimming with sharks, when a sperm whale carcass appeared on O‘ahu’s south shore last month, we strongly encourage people to stay clear of this carcass,” said Jason Redulla DOCARE Enforcement Chief. Disturbing a carcass or collecting anything from it, is against the law. DLNR’s Division of Aquatic Resources, DOCARE, and NOAA Fisheries personnel are currently assessing options for removing the carcass. They expect removal to be challenging due to the heavy weight of the carcass, its overall size, advanced state of decomposition, and its position on the reef. Hawaiian practitioners have been engaged regarding cultural protocols and respectful handling of the remains.